Another one that's average / slightly smaller than average, but the pattern took me and I wanted to share it - here's my thinking --> note the white nose and white "tail stop", ie the red pattern ends just before the tail starts leaving a white gap, which mirrors and balances against the white nose. 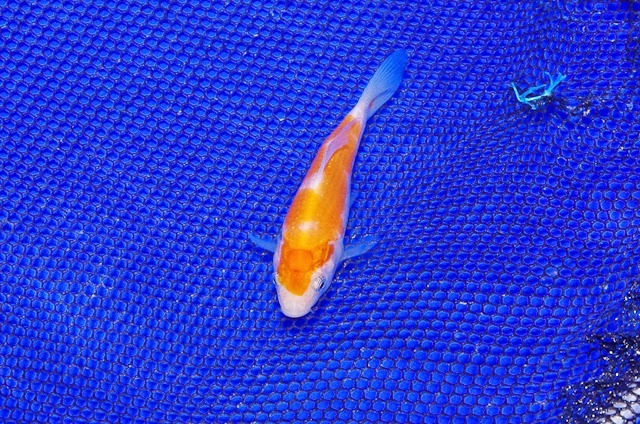 Most of the red pattern is above the lateral line - whether that should be the case this early in the koi's development will be a trait to watch. Development concerns are over the head shape and there's a tiny fleck of red in the tail. Had to take this through to the next selection though based on pattern.